Most coffee enthusiasts are switching to the ‘cold press’ method to make delicious cups of coffee like never before. If you enjoy experimenting with coffee grounds and different flavors, you need to invest in the right tools to make the perfect beverage which is undoubtedly the Toddy Cold Brew Coffee Maker. This coffee maker is great for any novice who is on the lookout for an easy to use coffee maker. 67% Less Acid: The ingenious Toddy Cold Brew Coffee Maker is designed to brew coffee with 67% less acid. This allows you to make drastically better tasting coffee than with hot brew methods. Patented Cold Brew System: The Toddy Cold Brew Coffee Maker utilizes regular coffee beans to make a delicious cup of hot coffee. What’s best is you won’t need electricity. ​Versatility: Apart from a great tasting cup of coffee, you can also make delicious tea, served hot or cold. 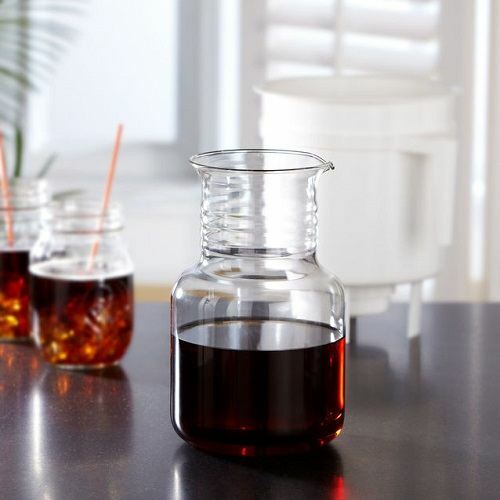 This makes the Toddy Cold Brew Coffee Maker great for both tea and coffee enthusiasts! ​Recipe Guide: Apart from a set of instructions, the coffee maker also comes with a recipe guide so you can try new recipes. Includes: Glass decanter, brewing container, 2 reusable filters, 1 rubber stopper and the instructions. Great Tasting Coffee: Since cold brew coffee utilizes a milder brewing process, people with sensitive stomachs can enjoy coffee without worrying about heartburn. The low-to-zero acid content makes drinking coffee a much more enjoyable experience. Long Shelf Life: Did you know that cold brew coffee has a longer shelf life? You can conveniently make a fresh batch using the Toddy Cold Brew Coffee Maker and store it for later use. ​Tons of Resources: Toddy includes tons of recipes and resources including FAQs on their website. This makes using the coffee maker easier and hassle free. 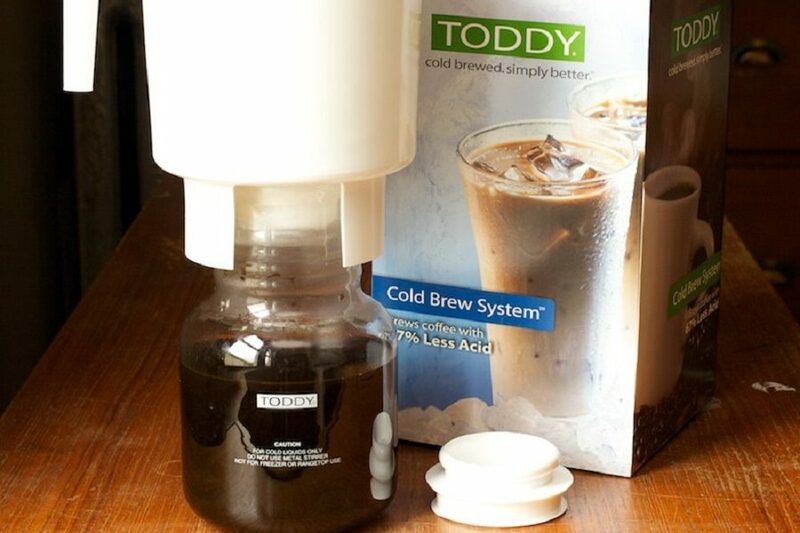 Easy to Use: The Toddy Cold Brew Coffee Maker is a great coffee maker for beginners because it is so easy to use and comes with all the instructions you need. Difficult to Clean: Cleaning up the brewer can be messy without additional paper filters. Leakage: If not inserted properly, the detachable rubber plug at the bottom can cause of leakage. You have to be careful about this. 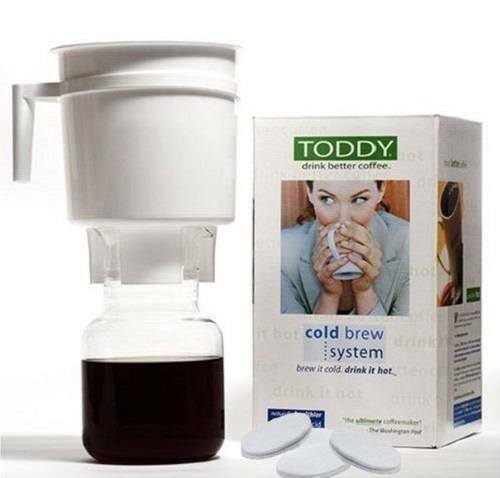 The Toddy Cold Brew Coffee Maker can be purchased on Amazon for . The Toddy Cold Brew Coffee Maker is a great buy for people who are serious about their coffee and do not want to compromise on good taste. However, for added convenience, you can find a better coffee maker in the market that features a metal filter for a few more dollars.